of Assam’s first dictionary writer Jaduram Deka Baruah. He brought out the first modern Bangla-Assamese dictionary about 175 years ago. Shri Hridikamal Baruah, grandson of Jaduram Deka Baruah in Assamese. 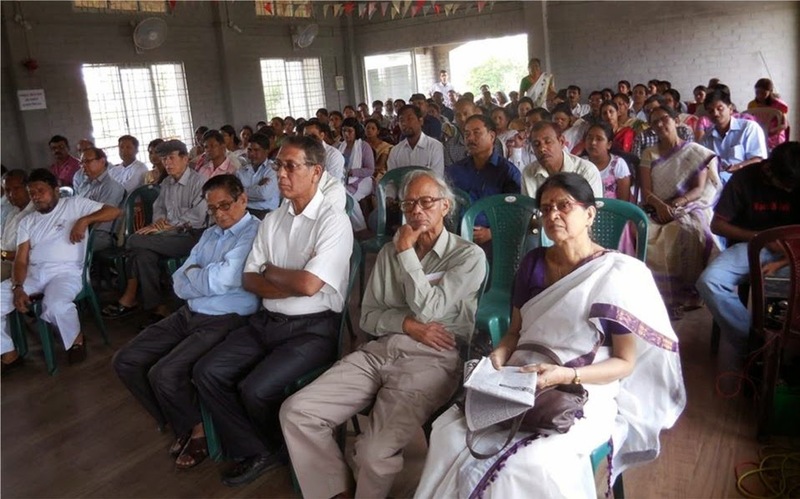 The 213th birth anniversary ceremony organised at Kathasilpi Dimbeswar Dayal Sharma Sabha Ghar, Jatiya Bhawan, Jorhat was chaired by Dr. Madan Sharma, Professor of Department of English and foreign language, Tezpur University. He is also President of Assamese National Dictionary Publication Committee. 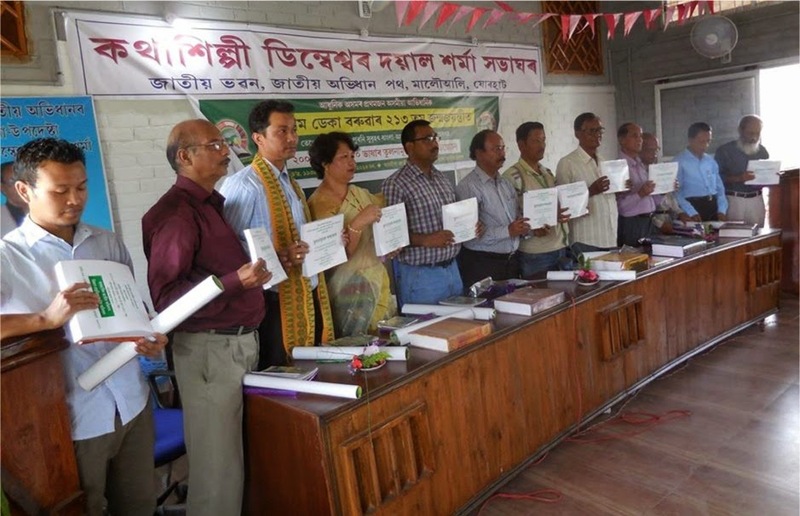 On the occasion, family members of dictionary writer Jaduram Deka Baruah including Hridikamal Baruah, Rajkamal Baruah, Nilkamal Baruah and Bina Baruah were felicitated. Born about 200 years ago on 12th April in the present Jorhat, Jaduram Deka Baruah was the first person to compile a Bangla-Assamese dictionary covering almost all words of Assamese language in the year 1839. A historian, who worked under British government in Assam, Jaduram Deka Baruah was well versed in several languages, such as, Sanskrit, Bangla, Persi, Assamese, Tai, English, etc. Speaking on the occasion, Dr. Devabrata Sharma, Chief Editor of Assamese National Dictionary and Editor of the reprinted dictionary of Dr. Francis Buchanan Hamiltan with the title “Comparative Vocabularies of 10-languages of North East India”, printed and published by Asom Jatiya Prakash, told many interesting things about the meticulous journey of retrieval of the original dictionary of Dr. Francis Buchanan Hamiltan had hand-written in ink on paper from the archive of British Library. It was made possible for the sincere efforts of Dr. Raktimranjan Saikia with the help of Ms Rini Kakati of England. The sources state that the dictionary compiled by Dr. Hamiltan covered nearly 20 thousand words of ten languages of North-East India. The languages that Dr. Hamiltan compiled with meaning in English were found as characteristic of a country (des) and of a group (jat). 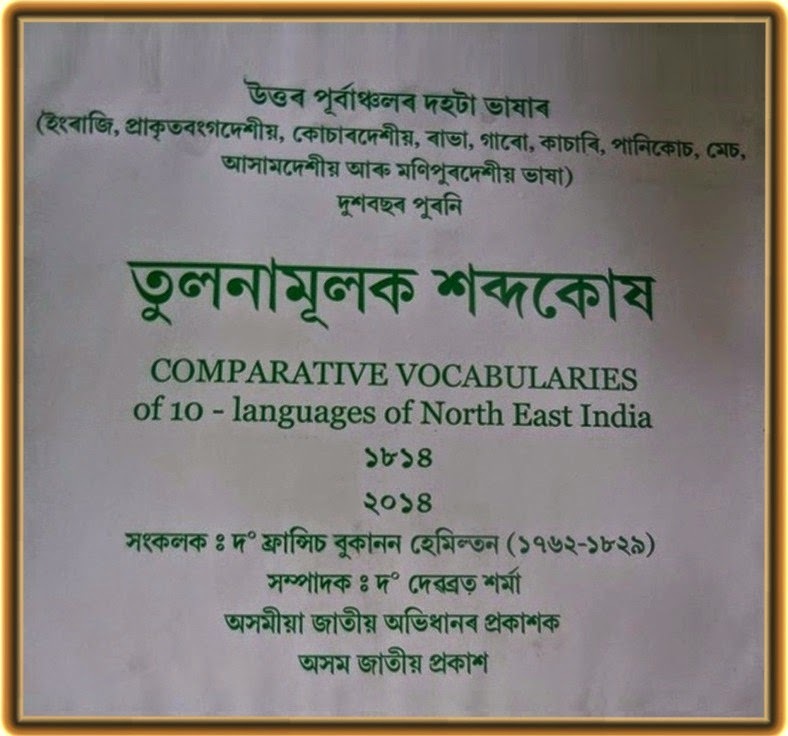 These regional languages were mentioned as Prakrit Bangadesiya (Bengali), Kochardesiya (Koch), Rabhajatiya bhasa (Rabha), Garojatiya bhasa (Garo), Kacharijatiya bhasa (Kachari), Pani Koch Jatiya bhasa (Pani Koch), Mechjatiya bhasa (Mech), Assamdesiya bhasa (Assamese) and Manipur Desiya bhasa (Manipuri). Among them, the Pani Koch language was in extinct. This historical dictionary has opened up brighter prospects for research and studies in comparative vocabularies. Release of such a dictionary by ten dignitaries of respective languages has also shown example of unity in diversity and exhibited equality, reclaiming identify of different ethnic communities living as greater Assamese fraternity. How do I get this book? Can I have it ordered online?